Single family ground level canal front home. 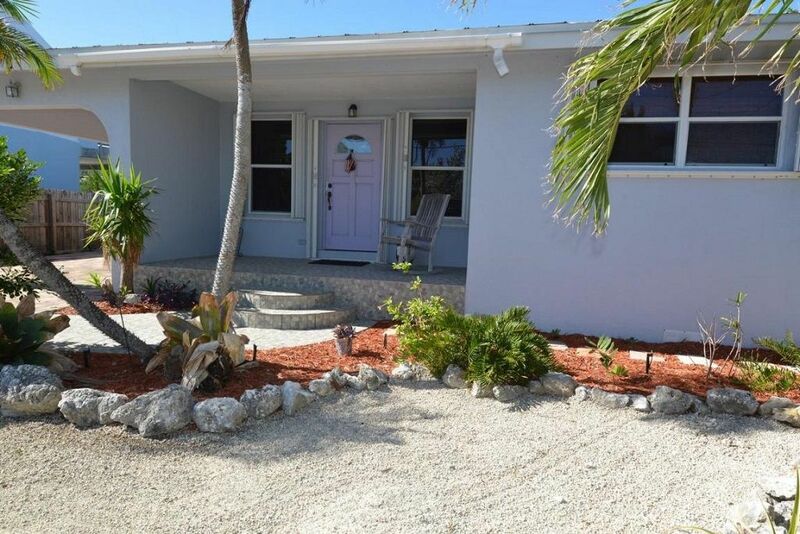 This home is located in Marathon and ready to house you and your family for any occasion. This 2 bedroom, 2 bathroom ground level home is decorated with a Thai Asian style immediately transporting you into another environment of zen. This home comes with a fully equipped kitchen for all of your cooking needs. The lounge area off of the kitchen offers an Asian daybed, perfect for relaxation or meditation. The open living room is perfect for any family who like the sense of an open room. The living room also offers a flat screen tv along with an entertainment center. The master bedroom consists of a California king and the master bathroom consists of beautiful tile work on the walls and comes with a soaking tub and glass walk in shower. The second bedroom comes with a king size bed and bright colored furniture to light up the room. Once you step into the back of the property, you will notice the large tiki hut covering the outdoor dining area overlooking the deep water canal. Alongside the tiki hut is a covered patio for extra seating or outdoor activities. Behind the tiki hut also comes a step down dock, perfect for loading and unloading your fresh catch from a day of fishing. Accommodates 6. Rents by the Week, Jan. & March-Dec.; Rents by the Month in Feb. Location, Location, Location! This home is in the Heart of the Florida Keys. Just a short ride to Key West or to Key Largo, right in the middle of it all! Swim with dolphins, manatees and turtles. Excellent fishing and breath- taking sunsets! It is the perfect place for beach lovers, boaters, fishermen, kids, families or honeymooners. Great home to stay in. We had a great time, it was a great house for two couples, two bedrooms, two baths, tiki hut, on a canal. Really nice place. Only negatives were the kitchen and bathroom sinks. Faucets were loose. Kitchen sink sprayer not working. Thanks for staying with us! Next time just call the office if you encounter any maintenance issues. We have a 24 hr maintantence staff to deal with any issues and they would have fixed the sink immediately. I am glad you liked the house! Please come stay with us again. Very “fun” decorated, spacious and clean! Far exceeded anything we ever could have expected! Loved the house, the decor and the back tiki area! Absolutely one of our best vacations ever! Can’t wait to come back!!!! Lovely home. A/C issues upon arrival, but they were quickly resolved, however Master bedroom is slightly warmer...had to use 2 fans and keep door open to keep from getting warm. Overall though, nice place...would stay again. I have been dealing with Leslie since 2008 and have always had a great experience. Our stay here is the BEST, we will never rent anywhere else. The unit is always clean and if we ever run into an issue, it is resolved within minutes. Do not hesitate to stay here, or in any of the other units covered by Leslie....you won't be sorry!